There will be a teaser next week when when the first 4 pieces are shown at the CMA Salon Series (Friday, March 27th at 12pm) and the Curran inspiration piece is revealed. The press release for the show is below. Weekends 1-4pm, or by appointment. Feeling creative, the artists at vista Studios/gallery 80808 decided to play a game. 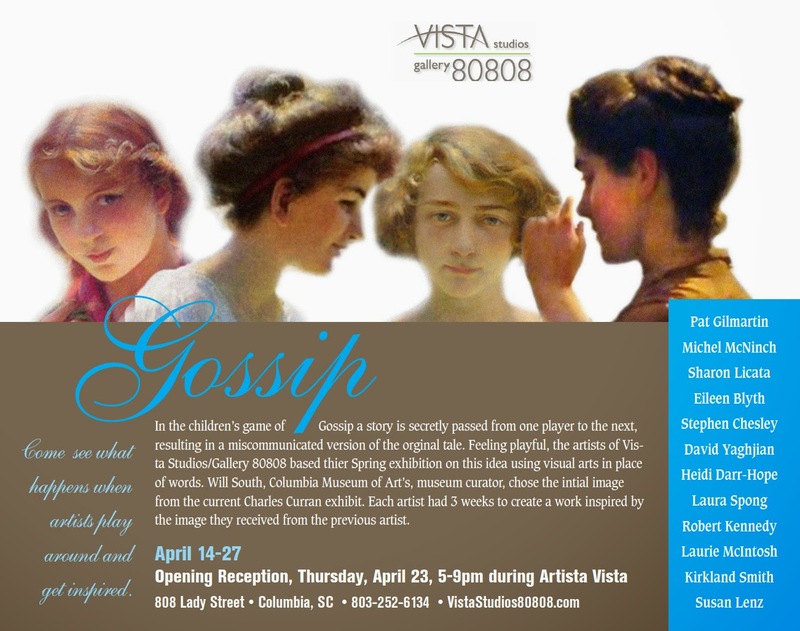 Based on the children’s game of Gossip, where a phrase is secretly passed from one player to the next, the artists have used visual art in place of words. Partnering with the Columbia Museum of Art, the curator, Will South, choose a piece from the Charles Curran exhibit which is currently on display. He shared this inspiration piece with first artist only, who was given 3 weeks to create a work of art and pass the new piece to the next artist. Each artist had 3 weeks to complete a work inspired from the image received. The game has been in play since last Spring. None of the artists have seen the progression of work and are excited to share it at Artista Vista. Come to the opening April 23rd, from 5-9pm and see what happens when artists play around and get inspired. In addition to the Gossip game, the artists will present other new work. Stephen Chesley, well known for his semi-abstract paintings, will present some new landscape pieces for the show. Pat Gilmartin has been exploring a new direction with her art – that of glass fusing, sometimes combining fused glass with glass mosaics. She will be showing several of her new pieces, as well as some of the figurative ceramic pieces that she has become known for over the past several years. Susan Lenz will show a selection of matted and framed floral images, which are the result from literally pounding delicate wildflower blossoms onto 100% cotton rag mat board. Clover, verbena, and other wildflowers were gathered from the artist’s backyard. Pigment from the petals and leaves left realistic floral impressions, and each work was enhanced by only a few pencil lines. No watercolor or other technique was used. Laurie McIntosh continues in her work in “Pages.” an ongoing series of deconstructed paintings created with multiple layers of calligraphic marks and grounds. The deconstructed pages are then reassembled and unconventionally bound to create new visual relationships between the images. Michel McNinch’s work continues to reflect the South Carolina landscape with an emphasis on atmosphere. The Gossip theme inspired a larger work based on her participating piece in which she plays with the light on the water.